Or hey, even EMUs. We already use them on the subways, so why not start building overhead wires on the Commuter Rail too? Very simple to do, and can improve both acceleration and top speed. EMUs in Japan--non bullet trains, by the way--are set to run at 160 km/h, or 99 mph, by 2010. EMUs are a great idea, but maybe more in the form of something that can fit other places as well. I think the Fairmount should just be a REd Line extension, rather than it's own line. it would branch at SS and go on to Readville, or maybe even 128 so park&riders can have an easy commute. Implementation could start small: Fairmount and Needham lines, for instance. Overhead wires could be laid on parts of the Commuter Rail to enable rapid electric service on larger lines, too--Boston to Lynn, Reading, Anderson RTC, Waltham, Framingham, Brockton, etc. Gradually they would be extended, allowing the entire Commuter Rail system to run on electricity. Theres a problm with running RT and conventional trains on the same tracks, there are FRA regulations against it. Also, the MBTa hasn't really looked at electrification as something worth persuing, possibly because it'd take forever. This would also make Rapid Transit extensions easier. Suppose the Red Line were being extended from Alewife to Waltham. Just stick in a single express track for commuter rail trains, give the Red Line cars pantographs (ala Blue Line), and run the new service with ease. No need to build an entirely new batch of stations or two new tracks right from the get-go; they could be gradually implemented as demand increased. If they were to electrifythe lines, it'd be better just to do it with 3rd rail(like Metro-North and the LIRR) instead. that way they wouldn't need all the different things and switching. This isn't an option since the Fairmont line is the only alternative coming into Boston from the Southwest. Not to mention how expensive it would be. *make a connection to the South Station Red Line platform or Reuse the infamous loop track for red line cars. *rework Readvill so that the NEC connects to the Franklin line and the station and make it so these new Red Line trains can turn around. Anyone have updates here on the new stations or TODs? Has this taken stimulus money? What are the next steps? The stations all went out to bid this year and should be done by 2012. A study was done and the best headways possible will be 20 minutes, due to crowding at south station. Its still not decided how the fare structure will be. They had the foresight but not the money. I think those underground loop tracks were destroyed long ago. As for the loop, as I wrote in the 2004 thread, South Station was originally built with a double track lower level loop, which was intended for use by commuter trains. A steam-powered ceremonial train filled it with smoke shortly after the station opened, and it was never used in revenue service, although if the New Haven RR had electrified its Boston suburban service at the beginning of the last century (beyond the experimental Nantasket Branch service), it undoubtedly would have been. There was a lower level waiting room beneath the current station headhouse. It became a bowling alley that was in use into the 1970s and the space existed until the major reconstruction of South Station in the late 1980s. The east portal to the loop tunnel was visible until the station throat was rebuilt during the Fort Point Channel bridge replacement and I-90 tunnel construction a few years later. 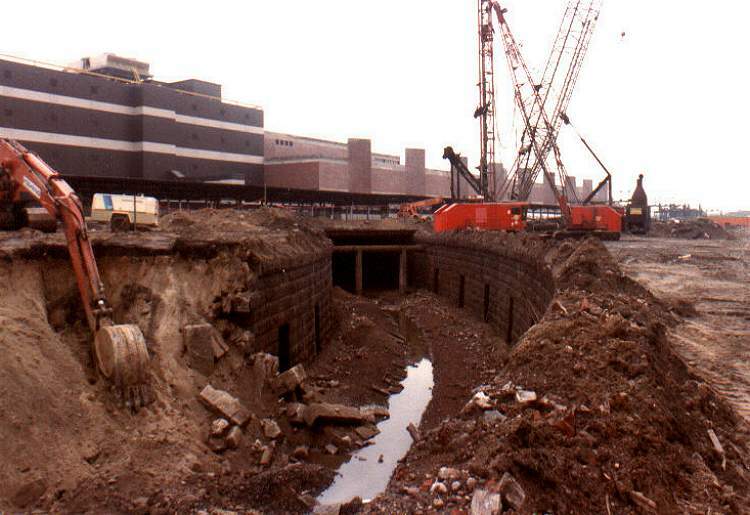 We might as well fill in the big dig to follow the Boston tradition of abandoning useful tunnels. Good to hear some news about this. 20 minute headways maximum isn't going to qualify this as a rapid transit line, is it? What, by the way, are the plans for the postal annex - I saw way back in the thread Van had mentioned that increased capacity could be added to South Station there, which I suppose could improve significantly on the headways. But are there other development plans for it as well? Note the website. You wont find that info on the mbta website. The proposed schedules are on page 58, and theyre a wee bit disappointing. The consultants are yahoos, and the MBTA guys are dopes. These aren't new, are they? They're marked Jan 2008 and Nov 2007. They look good though - hope that hasn't changed. I wonder, though, who's going to be using Newmarket? It's in a pretty empty area. Is it close enough to South Bay? Will this spur residential development around the new station? they are nto new... just didnt see them or links to them anywhere on this thread. there ar emore detailed PDFs that are new on each mbta projects page for each one. I do renderings for half the projects I'm involved with. They all look good. After all, they omit nearly all messy reality to present a perfect world. Outside renderings, where can you actually find the perfect world? Uh, how do these look any different than standard commuter rail stations?